1. Limit the radius of Google AdWords Keyword Planner to get a more accurate picture of the local keyword universe. 2. Treat the geographic qualifier in the keyword phrase (the name of the city, in most cases) as part of a long-tail query. But these are points on execution, not strategy, and offer limited utility. Effective local keyword research requires a holistic understanding of how local search works and how near-term and long-term business goals should inform decision making, especially as they relate to content marketing. For product or service pages, businesses that sell in a specific geographic area fight for search engine real estate with a subset of similar businesses and can benefit from this reduction in competition. But they also face search engine–imposed limits to reach because of their geographic qualifier. Overcoming that plateau has nothing to do with better keyword research or traditional Search Engine Optimization tactics. Local keyword research for content marketing is exponentially more challenging, requiring connections with searchers not just on the basis of buyer persona or product interest, but on that buyer persona having those interests in a specific geographic area. You can’t sell an ice cream cone in New York to a reader of your ice cream recipes in San Francisco. For service pages, we’ll use the automotive industry as an example. A local GM dealer competes with other nearby dealers, but it also competes with non-dealerships, like auto repair shops or used car vendors. Ultimately, a framework for service page keyword research follows overarching factors that affect local rankings: location, relevance, and prominence. Location cuts both ways. For an automotive dealer, Google’s heavy reliance on location (in this industry it vastly outweighs relevance and prominence) insulates dealers from competition outside their immediate physical location. If you’re the only game in town, you can count on ranking first for make-specific terms with very little effort. A verified Google My Business page should suffice. 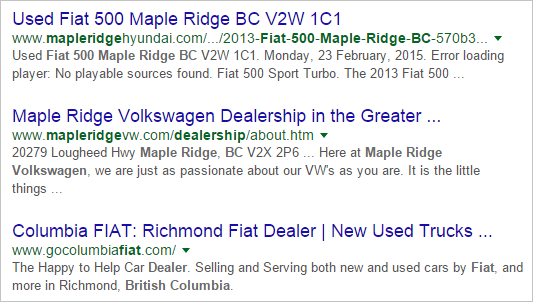 For example, the only FIAT dealer in Maple Ridge, British Columbia, ranks first—and will always rank first—for simple queries such as “fiat dealership maple ridge bc”. But what about the rest of the search engine results page (SERP)? Is it filled with other area FIAT dealers? Does relevance outweigh location? At least in the automotive industry, location trumps relevance. The dramatic ranking decline confirmed the preeminence of location. The surprise wasn’t that the dealership didn’t rank well farther from its physical location, but that, in most cases, it didn’t rank at all. There was no gradual decline, no partial credit for relative proximity. And that’s why understanding how Google views an industry, and what billions of user clicks suggest to its algorithm, is vital. Google has enough data to predict that users, even when adding a vehicle make to a query, still value location over relevance. As a local business, your first priority is to rank for queries in your physical location. Beyond that, Google has placed tight limitations, at least for automotive dealers, but likely for many other industries as well. And it’s essential to know where Google places those limits for your industry. About a year ago, we began researching ways to increase Original Equipment Manufacturer (OEM) dealer visibility for auto repair and auto parts queries. Traditional SEO order of operations began with an assessment of on-page factors, as well as competitor analysis. As we started doing these things, however, a pattern quickly emerged. 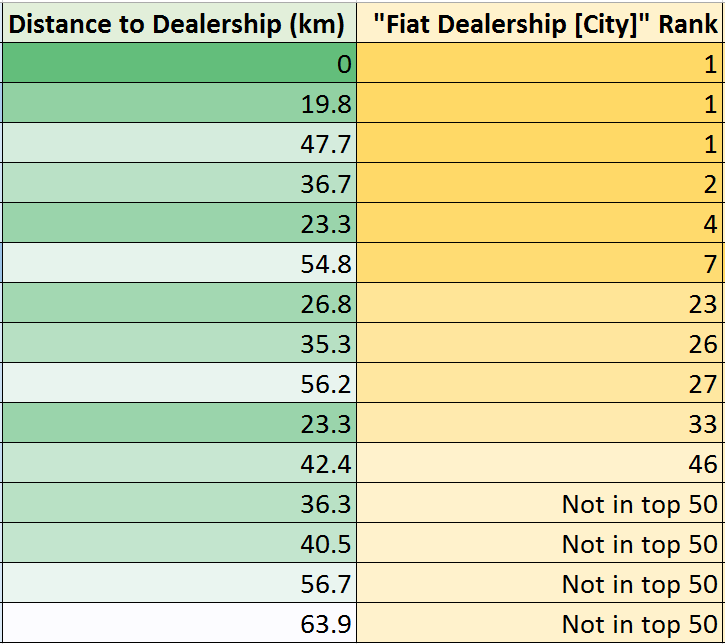 No dealer ranked among the top ten results. But it wasn’t a failure of optimization—Google simply didn’t place OEM dealers in the same bucket as auto repair or parts shops for make-neutral queries. The search engine viewed (read: had user data that established) generic shops as more relevant than OEM dealers. But most were first among dealerships. When a make was added, like “cadillac repair toronto”, the SERPs returned a mix of dealers and repair shops on the first page, but there was very little, if any, search volume for those make-specific repair queries. 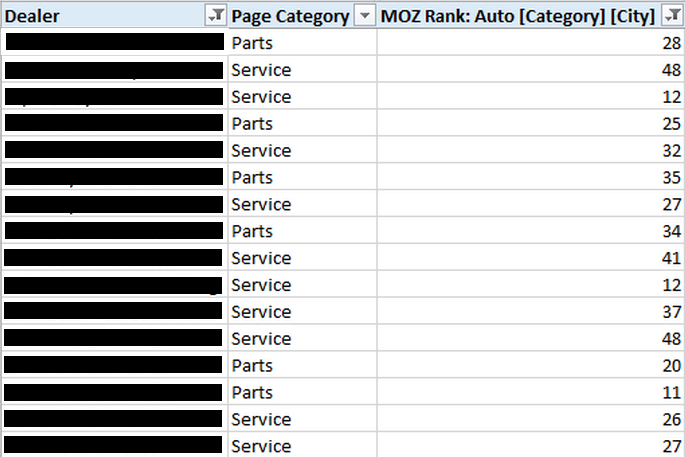 Ultimately, we found a more lucrative keyword pathway by developing pages for specific auto repair needs, which removed this bucketed delineation between auto repair shops and OEM dealers. 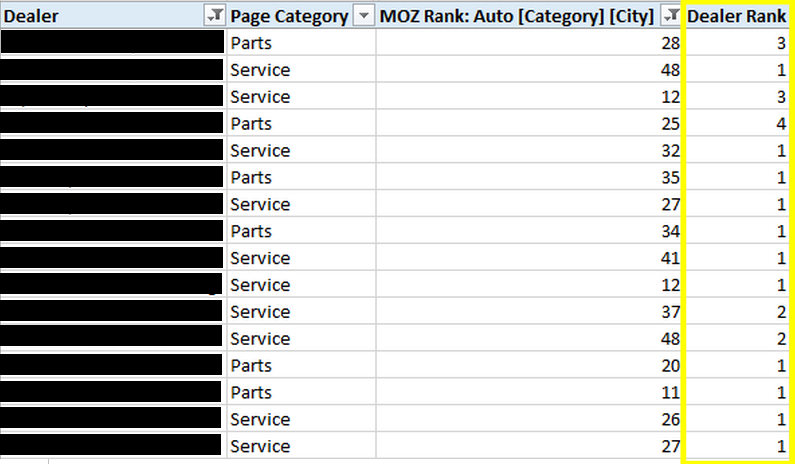 It’s easy to imagine the wasted effort that could’ve gone into optimizing a dealer service page with the intention of ranking for make-neutral auto repair queries when Google was filtering results before considering on-page factors. For local keyword research to succeed, planned keyword targets, regardless of volume or difficulty, must include your business and similar businesses in search results. Fighting Google is fighting against its data trove. You will not win. So how does a local business expand beyond its physical location, or gain traction for services or products outside a search engine–defined bucket? Brand. And not brand building to influence ranking factors—it’s unlikely that the an attainable level of prominence would outweigh location. Instead, the goal is to generate more branded queries, the SERP monopolies protected from external, mercurial algorithms, and influence click-through rates for lower positions. This is why SEO has matured into more than a checklist of technical optimization strategies. SEO provides a way to evaluate existing technical weaknesses while also supporting local businesses’ efforts to transcend those technical limitations through establishment of a trusted brand. Brand, built through a combination of offline and online efforts, is how to climb beyond the plateau. Brand expands geographic reach because users search for your business, regardless of whether it’s located in their town or the next one over. It removes the location qualifier from the query. And, for nonbranded queries that continue to include location, a strong brand offers a level of familiarity and confidence that leads users to click a result that might rank fourth or fifth, rather than settling for Google’s location-centric suggestion. Content marketing for local businesses presents a unique challenge for topic selection and keyword research. For ecommerce companies and sell-anywhere businesses, it’s a two-dimensional strategy: balancing content that hones in on the buyer persona with product-focused topics. 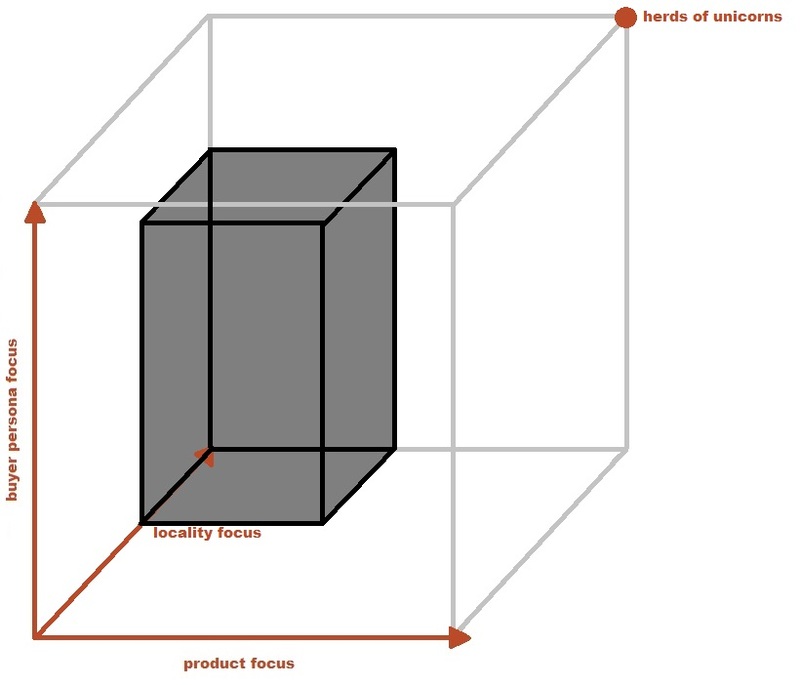 Sell-anywhere businesses benefit from a two-dimensional framework. 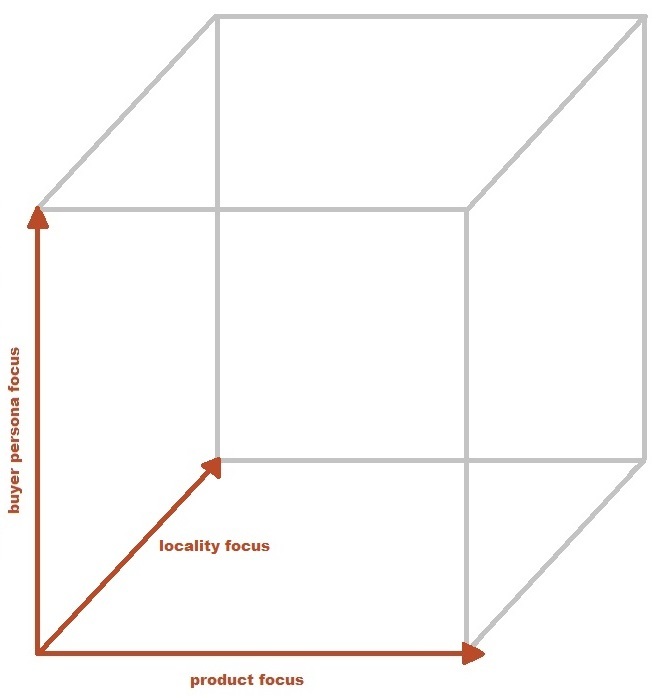 Adding locality as a variable creates a three-dimensional framework. Without a doubt, local content marketing risks greater waste. The question is where, for your business, is that waste most likely to occur? For example, a geo-targeted video designed for a buyer persona may waste 65% of views because those consumers aren’t interested in your product, but a geo-neutral video designed for someone interested in your product may waste more views because 95% of consumers are outside your sales area. Finding local content marketing topics almost certainly requires moving away from product-focused queries, which typically don’t retain enough local search volume to be of value, and broadening the buyer persona. Geo-targeting, unless you’re in New York City or Shanghai, greatly constrains search volume, turning high-value long-tail queries into content-for-one ventures. Successful local content marketing may require deference to geography. Will you be local forever? Content marketing can serve as an effective brand ambassador as you expand, whether that means adding physical locations or increasing your service areas. If you will be local forever, then content marketing should remain limited to geo-targeted topics that build awareness for your brand among potential clientele. But if not, high-volume, top-of-funnel, geo-neutral content can prime future consumers—even build anticipation—for your products and services. As we alluded to earlier, guidelines for local content marketing vary based on goals. Thus far, we assumed that lead generation was the primary goal, which requires getting qualified visitors to your site. What is your expertise? Businesses enjoy inherent authority for their industry knowledge and are most likely to be able to create this content successfully, even with limited resources. What knowledge gaps exist? What has no one else covered? (Yes, there are still some topics out there.) This is especially fertile ground for technology companies or those representing the leading edge of an industry. What transmission gaps exist for that knowledge? If everything has been said, has it been made available in a video? As interactive content? Is it well illustrated, sourced, and researched? Regardless of which path you pursue, it will require considerable investment, investment that may outstrip local resources, either in actual production or potential risk. (i.e. Eggs must be placed in separate baskets.) Still, if you rank on the first page for a popular query in all locations—if you saturate the SERPs—you will by default capture the impressions and clicks from users in your, and every other, geographic area. If, on the other hand, you think local topics are most lucrative, then the question becomes which local topics fit within your brand. Start by mapping aspects of your local community—defining characteristics, favorite activities, demographic profile—and assessing information gaps within it. Which topics does it make sense for your business to weigh in on? How can you provide value to your community? A geographic focus, in addition to attracting qualified leads, can also have a positive effect by ingratiating your business in the community. Whether you’re providing advice on the most walkable city parks or exploring an emerging local gastropub trend, you’re building credibility and connections with your potential customer base. For service or product pages, make sure you rank in your location. Test the geographic and topical limits imposed by Google for your industry. Build your brand offline and on. For content marketing, map past pieces in the three-dimensional keyword space. Gauge their performance by unique visitors, time on page, conversions, or whichever key performance indicator (KPI) you use to measure content marketing efforts. Find clusters of success, and pursue them. Find areas of abject failure, and avoid them. 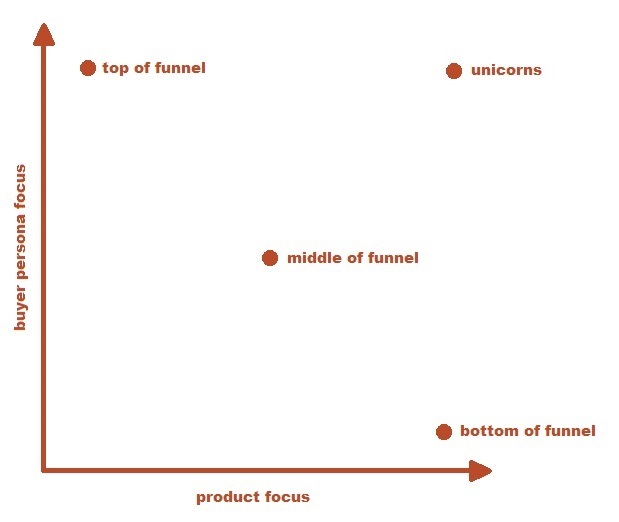 Be willing to eschew a focus on your product to connect with potential customers in your region. And go remind someone that keyword targeting—even when its limits are exposed—isn’t dead yet.